Enjoy three chef-inspired balanced meals each day served restaurant style in our beautiful dining room. We serve delicious fresh fare which includes whole grains, fresh fish and local produce. Religious observances and holiday menus are offered throughout the year. Dining services are available at no cost for all private room residents. Apartment residents are welcome to join us for any meal for a small fee. Residents may bring guests to any meal provided a reservation has been made in advance with dining room staff. Room service is also available to all residents for $5 per tray. Residents are welcome to schedule a family gathering in any of our several catering rooms by contacting our Dining Services Manager. We also have a private dining room for Residents that seats 12-14 people for holiday affairs or birthdays. The Private Room monthly and daily rates include three meals per day. Apartment residents are welcome to join us for any meals in our Dining Room at the rates noted below. All residents and short-term stay guests can invite family and friends to join them for meals at the guest rates below. Whether the occasion you are planning is a bridal shower, family gathering or a corporate event, Saint Francis will impress your guests with friendly service from our gracious staff, delicious cuisine, and classic elegance. We invite you to tour our charming 120-year old facility situated in a serene 20-acre park-like setting. You’ll see firsthand that our picturesque landscape and tranquil atmosphere creates the perfect backdrop for any occasion or function. A number of local schools and medical groups also utilize our services on a regular basis as well, and multiple churches hold retreats here. 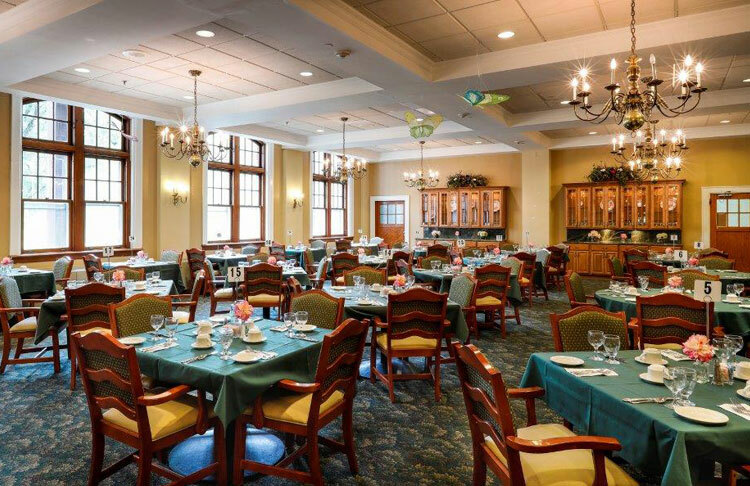 For more information or to request a proposal for an event, please contact Denise Finizio, Catering Manager at Saint Francis, at 973-627-5000 x123 or DeniseFauerbach-Finizio@saintfrancisres.com.